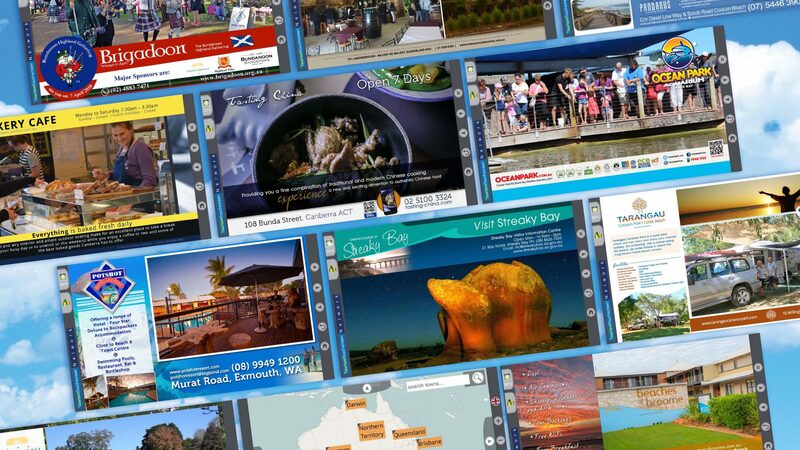 Explore the TourismTouchscreen Network to find out about things to do, eating out, accommodation, and shopping and services in destinations across Australia, New Zealand, the United Kingdom, France, and the Pacific Islands. The award-winning network has been developed over 20 years through partnerships with visitor information centres and tourism operators. You can view the entire network right here, as well as at 229 kiosk locations internationally. Start by selecting Explore the Region. Use the four arrow buttons, one on each edge of the screen, to pan to different areas of the map. Use the + and – buttons on the right side of the screen to zoom in and out. Click a cluster of towns to separate them, then click a town to visit its page. From there, select a category at the right to view its content, or visit the Welcome button to view the official destination content for the town. Click the weather and maps tab on the left to view up-to-date forecasts and navigation information. Within a category, click the up or down arrow buttons to scroll through content. At any time, in order to return to the previous screen you can click the back button at the bottom right, or click home to start again at the beginning.